Charlotte, NC (August 11, 2015): David Weekley Homes, the nation’s largest privately-held home builder, has begun construction in the exclusive, upscale community of Avignon and is now open for sales. Located in the shadows of Phillips Place in SouthPark, Avignon will feature 15 single-family homes and 18 townhomes. The first homes under construction include three move-in ready showcase homes. The two-story Quantum includes five bedrooms, five full baths and a two-car garage within 3,600 square feet. This home offers three bedrooms upstairs, each with private baths, a media room, retreat, walk-up storage, and brick and stone exterior accents. The Quantum will be completed in October. The second move-in ready home being built is The Equinox, a 3,600 square foot home with four bedrooms, four full baths, one half bath and a two-car garage. This two-story home includes hardwood flooring, granite countertops, 11-foot ceilings, heavy moldings and more designer touches. Also ready in October, buyers will enjoy a first-floor owner’s retreat, expanded bedrooms with in-suite baths and a retreat. The final showcase home under construction is the three-story Plaza, which offers 3,300 square feet with four bedrooms, four full baths, one half bath and two-car garage. The Plaza will serve as Weekley’s fully-furnished sales center in Avignon and includes quartz countertops, custom cabinets, natural night, 11-foot ceilings and hardwoods on the main floor and grand stair case. The owner’s retreat features a sitting room with fireplace, a coffee bar complete with built-in beverage counter and a private balcony. Buyers choosing to build from the ground up can select from floor plans ranging in size from 2,600 to 3,900 square feet, and featuring Old-world, European architecture and high-end finishes and fixtures. Prices for Avignon single-family homes start from the $780s. 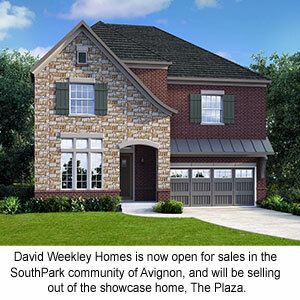 For more information about David Weekley Homes in Avignon, contact 800-393-9968.